While the growth rate of luxury home prices slowed across the country [See Redfin’s recent Luxury Home Prices Up 3.2 Percent Annually in the Third Quarter, the Lowest Growth Rate in Nearly Two Years], the story for luxury homes in the Reno-Sparks market is much different. The luxury home segment [defined as the top five percent of home sales] is the fastest growing segment in the Reno-Sparks market. Let’s take a look at the numbers. In 2017, the entry price point to the top five percent of sales was $769,000. In 2018, the entry price point to luxury home segment had climbed to $885,000 — a staggering increase of $116,000, or more than 15 percent. Compare that to the prior year’s increase when the entry price point had risen only 1 percent from 2016 to 2017. 2018’s gains in luxury home sales are even more pronounced when looking at the median sales price for the segment. In 2018, the median sales price for luxury homes was $1,177,500 — an increase of $227,500, or a whopping 23.9 percent over 2017’s luxury home median price of $950,000. What about the lower 95% of home sales? The lower 95% also saw gains in 2018, but not nearly as great as those in the luxury segment. The 2018 median sales price of the lower 95% of home sales increased 11.4% over 2017’s median – less than half the increase of the median price for luxury homes. Incidentally, the median sales price for the lower 95% of home sales was $367,500 for the year. 2018 also saw higher record sales in the Reno-Sparks housing market. The most expensive home sold for $4.9M in 2018. Compare that to 2017’s most expensive home sale of $3.5M. 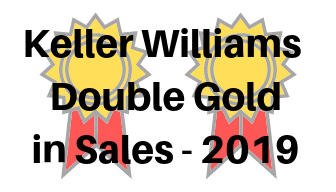 In fact, there were five home sales in 2018 that exceeded 2017’s record sold price. See the Reno Gazette-Journal’s The 15 most expensive home sales in Reno in 2018. These top-tier sales impacted the sales volume as well. In 2017, the sales volume of the luxury segment totaled $378.4M and accounted for 14.2 percent of the overall market volume for the year. In 2018, the sales volume of the luxury segment totaled $403.2M and accounted for 15.2 percent of the overall market volume for the year — an increase of 7.0 percent over 2017’s luxury market share. Where are luxury sales happening? The Northern Nevada Regional MLS divides the Reno-Sparks real estate market into 42 different areas. 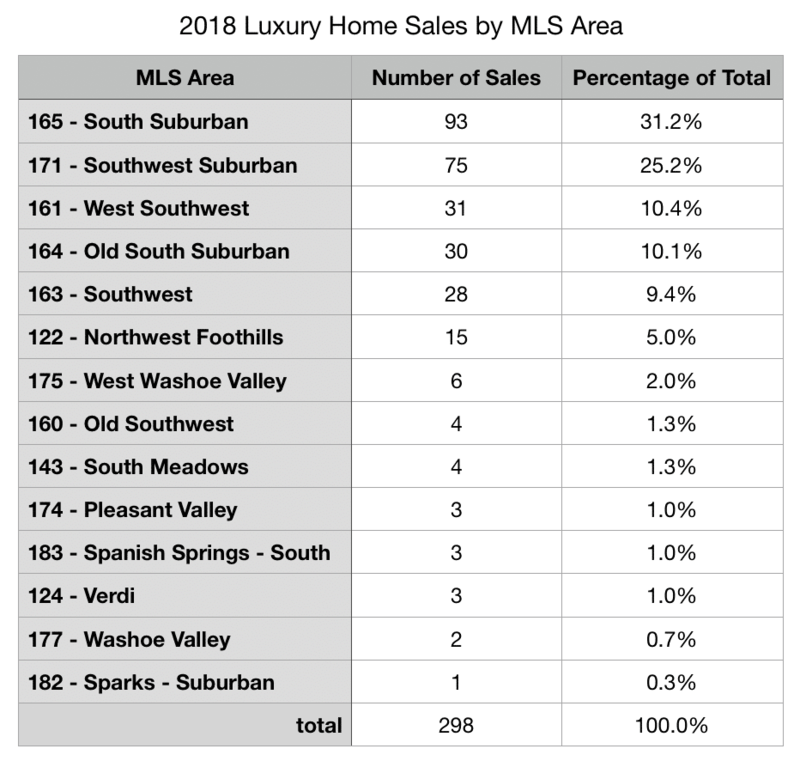 2018’s luxury home sales occurred in 14 of these 42 areas – with just five areas accounting for more than 86 percent of luxury home sales (see table below). Reno’s South Suburban area (ArrowCreek, Saddlehorn, Fieldcreek) accounted for 31 percent of luxury home sales — more than any other MLS area. 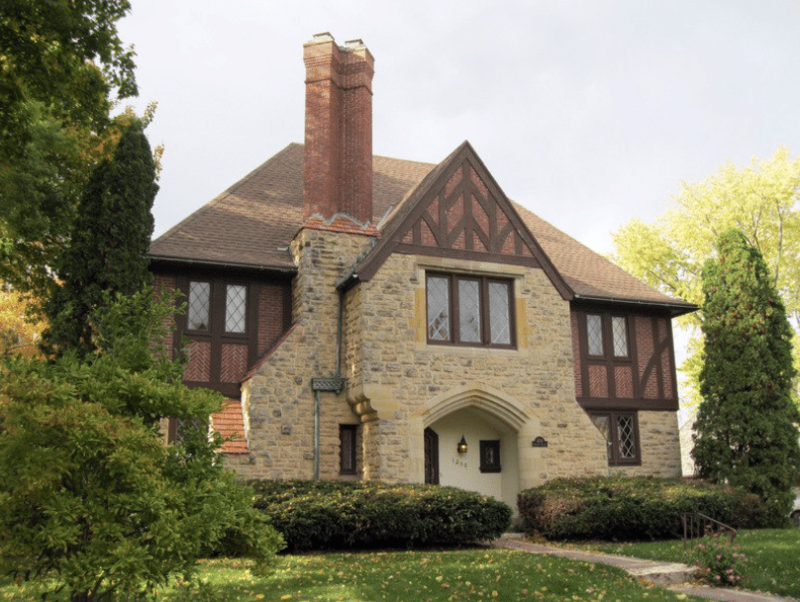 Reno’s Southwest Suburban area (Montreux, St. James’ Village, Galena Forest) took the second spot — accounting for more than a quarter of luxury home sales in 2018. Note: Click here for an interactive Google map of the MLS areas. While no one has a crystal ball, the current pending sales seem to indicate continued growth in the luxury segment. 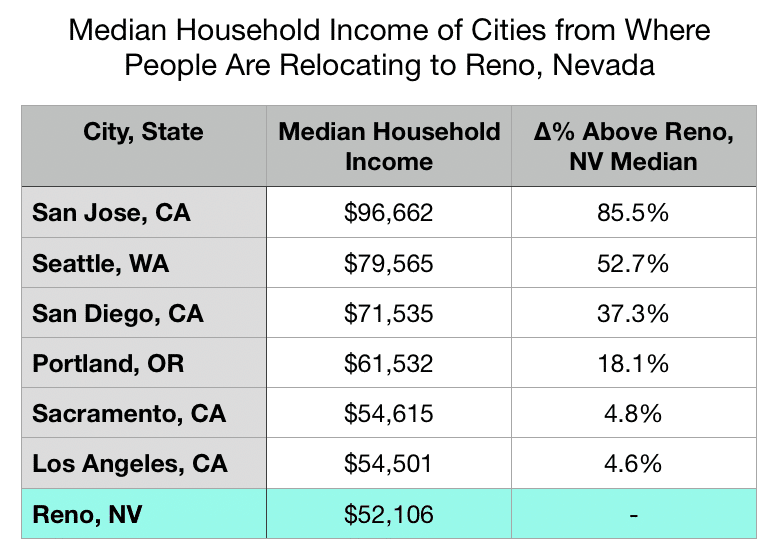 The table below shows the median household income of these areas compared to Reno’s median household income. People moving to the Reno-Sparks area with higher than median incomes can presumably afford to purchase higher than median priced homes. Look for Reno-Sparks’ luxury segment to continue to grow in 2019. The question is by how much. What are your thoughts? Thank you for reading. I would love to see your comments and thoughts below. Also, let me know if you have specific questions regarding the above information. This entry was posted in Agent Insights, Market Trends and tagged luxury home market, luxury home sales, luxury homes, luxury real estate, Reno luxury market, Sparks luxury market. Bookmark the permalink. If there was any doubt left about the huge impact Californians have on our housing market, that’s been snuffed out by the recent data presented here. Another influence is reported to be coming from Chinese and their increasing interest in the U.S. housing market especially California. Thank you for your comment, Twister. No doubts here.